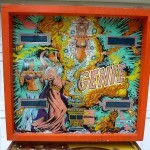 Gottlieb Genie, from 1979, was Gottlieb’s answer to Bally’s super wide Paragon. 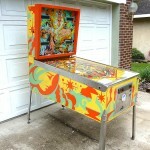 This was the start of “wider is better” pinball design in the late 70’s. 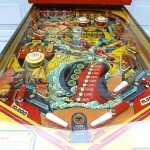 A typical pinball machine at the time was 22″ wide by 51.5″ long. Bally Paragon measured in at 28.5″ wide with the same length. Not to be out done, Genie is 28.5″ wide and 55″ long. That’s big! “A Wide-Body Pinball absolutely bulging with player appeal and proven massive profit earning capacity!” was a headline taken from the sales flyer of the day. Whether or not wider is better is debatable. It definitely is something different. 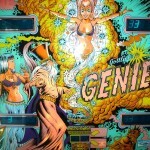 There is no doubt, Genie has some beautiful artwork. This particular game came in with display issues. Only 1 or 2 digits of the displays function. There’s a few things to check to figure out what is going on here. First is the power supply voltages to the displays. If that checks out, move a few displays around and check to see if the problem also moves. With the power off, swap #1 and #2, etc. If the problem is exactly the same, we possibly have a connector problem. All of this is outlined nicely in the Pinwiki for reference. 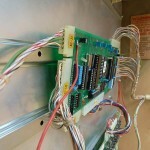 On this game, I replaced all the connector pins on the MPU for the displays. Those are A1J3 and A1J2. They were original and appeared to be dirty and depressed. Unfortunately, after replacing those connector pins, the problem is still there. What does this mean? We have a board problem. What can happen with these type of displays is if the connectors are removed when the game is powered on, this can damage the displays and/or the MPU. That’s probably not what happened here because I found evidence of a ground short. 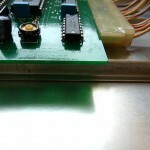 The MPU mounting tabs have enough flex in them that if the board or game is bumped while it is powered on, it will short itself to the metal behind it. This damaged the driving ICs for the displays. 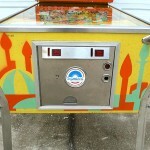 Since this is a Ni-Wumpf replacement MPU, I recommend sending it back to them for repair. If it can’t be repaired, it should be replaced with a new one. And of course, remount it with a few more tabs to prevent this from happening again. 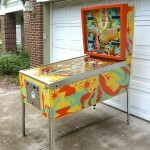 This entry was posted in Repairs, Mods & Shop Outs and tagged display, florida, genie, gottlieb, Pinball, repair, system 1, tampa by Pinball Shark. Bookmark the permalink.